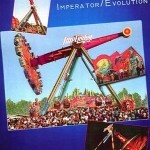 Premiering at Munich Oktoberfest in 1992, constructed by Nauta Bussink & Bailey of Holland, Evolution remains one of the largest rides ever to be transported. Weighing a massive 300+ tonnes, 33 metres (113ft) high and wheel diameter of 15 metres (45ft), it earned a Guinness World Record for the largest inverting carousel structure ever built. Evolution (also known as Imperator) consists of a giant arm bearing a rotating wheel holding 16 four-person gondolas on one end, and a set of 10-tonne counterweights at the other. With riders facing outwards, Evolution’s movement involves the freely suspended gondolas move upwards and outwards as the wheel turns. With this happening, the arm slowly turns 180° exposing the riders to strong g-forces before both movements usually stop, suspending the riders in an upright, inward facing position 33 metres off the ground. After a few minutes, rotation of the wheel and arm recommences to complete one 360° circuit before the ride cycle finishes. With the arm alone weighing 160 tonnes, Evolution travels Europe on 16 trailers (most classed as heavy over-size loads). More common is Fabbri’s Evolution, manufactured under license by Bussink’s design. At 21 metres (68ft) it’s considerably smaller, portable on two trailers and accommodates 40 riders in 10 cars. Unlike Bussink’s design, the gondolas are not suspended freely with 360° mounts but are controlled by pneumatic cylinders at the operator’s discretion. There are at least 3 Fabbri units in USA and 6 in Europe, both portable and park design. 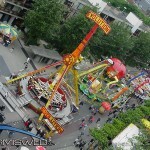 Uuuhuuuuuuuuuuuu, I love this ride very much, after it`s “antecessor cousin” Enterprise. Playcenter in São Paulo and Mirabilandia in Reci fe/Pernambuco have one too. And I dream of having one too, called “Air Supply”!!!! hahaha fui! scary!!!!!!!!! because it keeps you up in the air for about 1 minute at the start but once that is over your of and away loving it pooing it hands up amazing irl love to have one in my back garden i dont have to wish because i already have one in my back garden because im rich!!!! Cman, you are confusing the Evolution with maXair, which is a Huss Giant Frisbee (awesome ride, btw). I rode the one at Six Flags St. Louis (Excalibur) this year and it was quite an interesting ride. It spun a little faster than I liked but the ride experience was great. Like the fact that you didn’t go upside down though I think I would have liked the arm to do two revolutions. No there’s not^ Six Flags St. Louis one used to be at a German fair until it was moved to SFGAdv, as Evolution, then St. Louis as Excalibur. 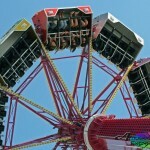 my bff rode a ride just like this but it was called the screamer i waited for her to get off . . . again!!! Did you guys know that it goes upsidedown? My legs waked my face HAHAHAHAHAH! 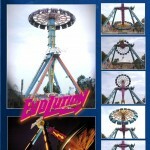 i just want to know if i can ride this cuz im 11 years old and i want to know if 11 year olds can ride this and btw there is going to b 1 at the oc fair which im going there plz someone comment me back to let me know if 11 year olds can ride this and also 10 year olds! PLZ!!! to oliver OMG REALLY I THINK I WILL B SCREAMING FOR MY LIFE!!!!!!!!!!!!!!!!!!!!!! The model owned by Jim Bishop, who books in with RCS at the OC Fair, LA County Fair, and many other spots is currently for sale. sydney,you are allowed on it. I WAS RIDING THE EVOLUTION WITH MY KID SISTER AT THE CLARK COUNTY FAIR IN VANCOUVER WASHINGTON, AND ONE OF THE PINS FELL OUT OF THE SIGN AND HIT THE DECK. WAY TO GO BUTLER AMUSEMENT. THATS ANOTHER GOOD ONE. BUTLER HAS BEEN HAVING LOTTS OF BAD THINGS GO WRONG. WHAT THE HELL IS GOUNG ON????? What is the cost to build/buy one of these.? They have a new ride called the SuperFlip360 in Rehoboth Beach, Delaware, at Funland. It is essentially the same thing as this.